Preparation of sour beets doesn’t differ too much from preparing sauerkraut. 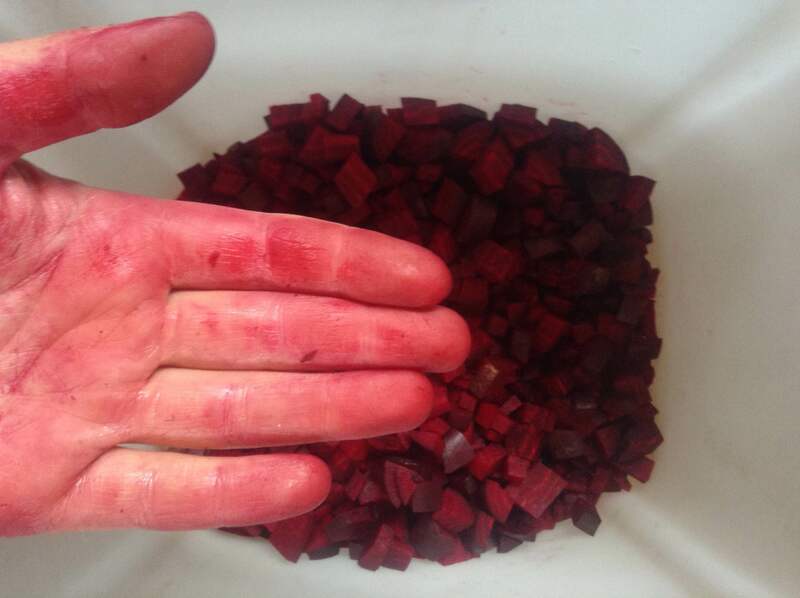 At first I washed 11 beets and left the skin (they were bought at bio-farm Leisenhof Gärtnerei). I chopped them in to small cubes and placed in the plastic bucket. I added 3/4 glass of whey (2 tablespoons of powdered whey dissolved in 3/4 glass of warm water), 3 tablespoons of sea salt without additives and 1 tablespoon of caraway seeds. I mixed it, pressed down and filled up with filtered water just on the level of the beet cubes. Since umeboshi added yesterday to sauerkraut worked perfectly creating already a mild and decent brine I poured a little bit of it on top of the beets too. Lets hope that it will ferment it the same well as it managed to do with the cabbage. I’ve put on top of it well fitting plate with a big jar filled with water to keep the beets under the liquid surface. As usually I’ve covered everything with a towel to protect it from any pollutions and stored in a room temperature. Today I’ve also started to build the candle incubators for growing yeast and bacterias. The idea for that came from a pure need. It suddenly became quite cold in Linz making my experiments way to slow. One incubator is assembled from candles, candle heater and steel container for drying utensils. Another one is put together with a use of a camping fridge, aluminium plates for grilling, paper tape, two clay pots and kitchen plate. Wider description with pictures will come soon since those two prototypes are going to be improved and accessible for wider public during upcoming very soon stwst48.